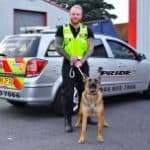 Pride GB provides keyholding, mobile security, static security, alarm response, and security dog services to Telford and the West Midlands. Our expertise makes us ideally placed to ensure the security of facilities such as construction sites, council buildings, factories, retail parks, void buildings, and industrial estates. 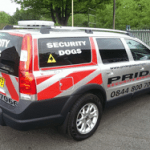 Pride GB is one of the only security companies that is accredited to use trained security dogs in Telford. 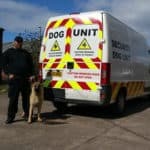 Our NASDU approved dogs are an effective deterrent against intruders and our highly-trained K9 security dog handlers always deliver a professional, high-quality service. Pride GB offers highly skilled, fully licensed, formidable, dependable static security officers who can undertake any assignment at any time. Our service is tailored to suit your needs and our high security standards are guaranteed. Our mobile security patrol service is designed to provide a highly effective deterrent, ideal for those who do not need a constant security presence. Our full uniform mobile security officers can patrol your premises whenever you require them. In the event of an alarm activation, Pride GB provides a 24/7 rapid response in which our professional team will deal with any incidents as required. We operate an excellent key holding and alarm response service in accordance with British Standards. Contact Pride GB today to learn more about our security services in Telford and keep your property protected and secure. Pride GB Security Services Ltd currently holds SIA Approved Contractor Scheme (ACS) status for the provision of Security Guarding and Key Holding.